The Vietnamese -- they said the Vietnamese -- the Khmer Rouge told us that the Vietnamese are our traditional enemies. They invaded Cambodia many times before, and stuff like that. 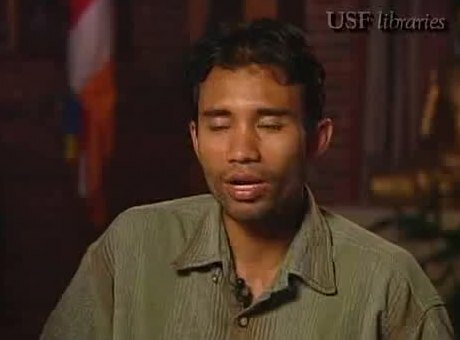 So you've got -- I was confused a little bit about -- and I was confused and hyped up a little bit by the Khmer Rouge saying that, that the Vietnamese are invaders and stuff. So I was feeling -- fighting also for my nation, to save my nation, and at the same time I feel the Khmer Rouge are not good people either. So in a way I will not -- and sometimes, when we were not given orders to take off, the Khmer Rouge sometimes would shoot us behind, because they said, "Who ordered you to take off?" So we were not -- we don't know whose side we were on. And I was just -- it's just confusion, and many kids got killed because the Vietnamese are very good. Most of the Vietnamese soldiers had experience with Americans, and we didn't know that. I know nothing! But I don't know why they are so good, and they kill us like hell. I mean, I was lucky. Kids were fighting with me, kids as young as they can carry guns and shoot, and we have to figure out how to do it, how to shoot, and why we were shooting, why we were in the middle of nowhere. And we have to figure it out quickly, otherwise you're not gonna shoot anybody or they're gonna shoot you. Many of the kids who became now like my friends, like schoolmates, we were cleaning guns together, and sometimes they blow their heads off because they cannot know how to clean the guns, and they go and they play around with guns and they blow their head off, and sometimes they burn themselves. And I became good friends with some of the kids, and in the battlefields sometimes they got shot in the left and the right from me, in the stomach and the head. Many times I held them, blood all over me. The worst feeling I had was that you can’t help them at all. You know, this kid's dying; you don't have medicine to help them, and you feel really much -- you feel you cannot do much. You feel helpless, and that's the worst feeling I had. You know, many times I scream very hard, because I want to save them. And these kids, many of the kids I don't talk enough about. They sometimes just naturally save you, like the Vietnamese would come close to you and they run in front of you and they say, "Want to save my life?" They get shot for me. And they're naturally doing that, and I was only thinking about getting myself away, getting myself, you know, myself from the bullets. I was one of the chicken kind of guys, kind of kids. Many of the kids who were brave got shot for me. I've learned in the end, though, I feel guilty during the time. I've learned how to also doing the thing they do, shooting without crawling. I saw kids and adults got hit in the head, the bullets, crawling. So I don't believe in crawling anymore. I just stood up and shoot like hell. You go crazy and suicidal, you know, like I don't want to think about anything else. And it may be pure luck; it's not skill or anything. There are many incidents. I fought about two or three months. The thing that I couldn't take is to watch my friends dying every day. That's the worst feeling.